A view of buildings along Castlereagh Street from the corner of King Street. 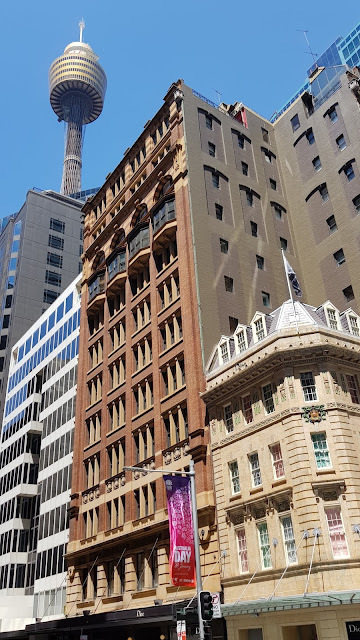 Looking at old and new architecture such as Sydney Tower, the OCBC Building, Culwulla Chambers and the former Surrey Hotel. The banner is promoting Australia Day, which is today. I like the blend of architecture. Happy Australia Day, Jim. Beautiful capture! Happy Australia Day! I normally don't like blended architecture, wanting to preserve or expand upon the original buildings wherever possible. Wow! What a kaleidoscope of architecture! HAPPY AUSTRALIA DAY, Jim. I like the old and new combo. I am lost streetwise though. Jim, Castlereagh Street runs parallel to Elizabeth St, Pitt St and George St, as one of the main streets in the city. A great selection of buildings all in the one shot, Jim.